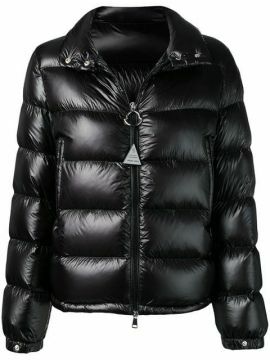 As 'ski jackets' remetem às jaquetas utilizadas para a prática do esporte de inverno. É fácil reconhecer o famoso modelo totalmente acolchoado e bastante colorido. A peça conta com fechamento duplo: um zíper frontal e uma aba em velcro que reforça o fechamento e protege o peito do frio. A jaqueta é mais um dos itens de origem athleisure e é ideal para looks casuais. O tamanho oversized é o mais ousado e o que mais remete às catwalks internacionais. Ao usá-lo em um look, deixe-o aberto, pois caso contrário você poderá aparentar que está acima do peso. 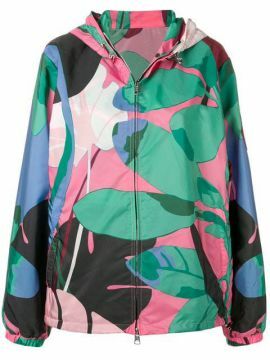 Encontre no Paraíso Feminino esta jaqueta e outras como as: jaqueta bomber, de paraquedista e muitas outras! Ski-wear meets the streets in Moncler s new collection. High performance-driven outerwear with a stylish twist, the brand is the last word in sports-luxe. Featuring a hood, a front zip fastening, long sleeves, side pockets and a short length. Ski-wear meets the streets in Moncler s new collection. High performance-driven outerwear with a stylish twist, the brand is the last word in sports-luxe. Featuring long sleeves, a padded interior, a front zip fastening and a goose down filling. Ski-wear meets the streets in Moncler s new collection. High performance-driven outerwear with a stylish twist, the brand is the last word in sports-luxe. 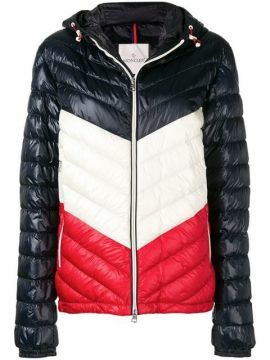 This blue, white and red feather down zipped padded jacket from Moncler features a hood, a front zip fastening, long sleeves, side pockets and a short length.